Samajwadi Party chief Akhilesh Yadav will do rallies in Kasganj and Moradabad in Uttar Pradesh and Aam Aadmi Party leader Manish Sisodia will visit Sangrur in Maharashtra to address a rally. NCP chief Sharad Pawar will address a rally in Latur at 2 pm and Osmanabad at 5.30 PM. Shiv Sena chief Uddhav Thackeray will address a rally in Latur. 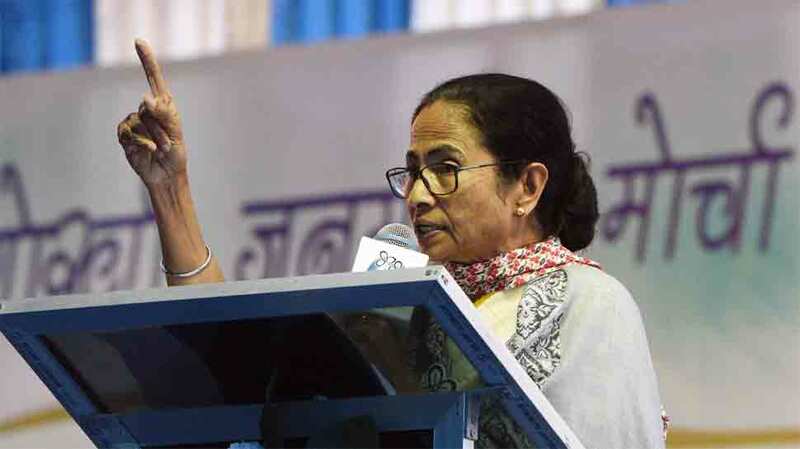 * Mamata Banerjee accuses Congress of taking help from RSS to win elections. * Defence Minister Nirmala Sitharama in Shivamogga, Karnataka: Pakistan says they are victims of terrorism. But when Jaish-e-Mohammad (JeM) claims responsibility for an attack and they have their training camps in Pakistan, then is it not Pakistan’s responsibility to destroy these camps? But they didn’t, so we attacked Balakot. * “No one has a right to talk about any women like this, it is a very derogatory comment. This shows what kind of a mentality he has. No one has the right to speak like this,” Hema Malini on Azam Khan’s remark. * Election Commission bans UP CM Yogi Adityanath and BSP chief Mayawati from election campaigning for 72 hours & 48 hours respectively, starting from 6 am tomorrow, for violating Model Code of Conduct by making objectionable statements in their speeches. * “It’s being done to create fear. It’s just beginning, it’ll take violent turn. Have asked for police protection; there’s a threat to my life; I’ve filed a complaint,” Urmila Matondkar, Congress candidate from Mumbai(N) on scuffle between Congress workers and BJP supporters during her campaign. * “Not only Azam Khan, but both Samajwadi Party and Bahujan Samaj Party should apologize to the crores of women in our country,” said BJP president Amit Shah. * Senior BJP leader Murli Manohar Joshi writes to Chief Election Commissioner Sunil Arora seeking investigation into the fake letter circulating on social media in his name. * “Priyanka ji said in the beginning that wherever you see, you’ll find publicity of Narendra Modi being done. Switch on TV-Narendra Modi, switch on a radio-Narendra Modi, walk on the roads-Narendra Modi. Where does all this money for publicity come from?” Congress president Rahul Gandhi in Fatehpur Sikri. * Congress MP Shashi Tharoor has been injured while offering prayers at a temple in Thiruvananthapuram and has been shifted to General Hospital there. He has suffered injuries on his head and has received 6 stitches. Doctors says he is out of danger. * SC issues notice to Union of India, & Election Commission of India on a plea seeking direction to bring all National & State recognized Political Parties under the ambit of RTI (Right to Information). * Supreme Court asks Election Commission to watch Vivek Oberoi starrer ‘PM Narendra Modi’ & take a call on whether it should be banned. SC asked EC to give its view to the court by April 22 in a sealed cover. Makers of the movie had moved SC against stay on its release by EC. * Supreme Court issues notice to Congress President Rahul Gandhi in connection with a contempt petition filed against him. Supreme Court has sought an explanation from him. * “One should not be afraid of these collectors, I will make district magistrate clean Mayawati’s shoes,” said Samajwadi Party leader Azam Khan.